For the state park in Pennsylvania, see Parker Dam State Park. For the pond in Maryland, see Parker Pond (Maryland). "Parker Dam". Geographic Names Information System. United States Geological Survey. Parker Dam is a concrete arch-gravity dam that crosses the Colorado River 155 miles (249 km) downstream of Hoover Dam. Built between 1934 and 1938 by the Bureau of Reclamation, it is 320 feet (98 m) high, 235 feet (72 m) of which are below the riverbed, making it the deepest dam in the world. The dam's primary functions are to create a reservoir, and to generate hydroelectric power. The reservoir behind the dam is called Lake Havasu and can store 647,000 acre⋅ft (798,000,000 m3) or over 210 billion US gallons. The dam straddles the state border at the narrows the river passes through between the Whipple Mountains of California and the Buckskin Mountains of Arizona. 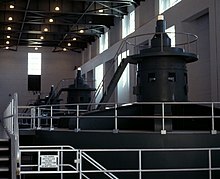 The power plant has four Francis turbines with a combined capacity of 120 MW. Each turbine weighs 60,000 pounds. The head is 72 feet (22 m). It produces electricity at 97 percent efficiency. Half of the electricity the plant produces is used by the Metropolitan Water District to pump water along the Colorado River Aqueduct, and the rest is sold to utilities in California, Arizona and Nevada. The generation of power is limited by a requirement to keep the water level of Lake Havasu between 440 and 450 feet (134 to 137 meters) for proper operation of pumping plants for the Central Arizona Project and the Colorado River Aqueduct. Lake Havasu is the water source for the Colorado River Aqueduct. The aqueduct is operated by the Metropolitan Water District of Southern California, which supplies water to almost all cities in the greater Los Angeles, San Bernardino, and San Diego areas. The district paid for nearly the entire cost of the dam, but it is owned and operated by the U.S. Bureau of Reclamation. Lake Havasu is also the water source for the Central Arizona Project Aqueduct (CAP). The project is designed to provide water for irrigated agricultural areas, as well as municipal water for several Arizona communities, including the metropolitan areas of Phoenix and Tucson. Construction of the dam was a contentious issue for Arizona. Built as part of the larger Colorado River Compact of 1922, several political groups, their members and privately owned utility companies in Arizona were not pleased with the plan in general and refused to sign it until 1944. 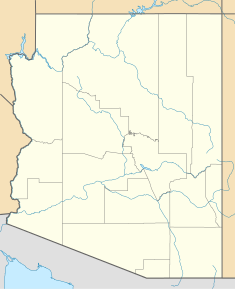 Even then Arizona continued to dispute its water allotments until a 1963 Supreme Court decision settled the issue. The court has had to adjust the agreement several times since, most recently in 2000. As recently as 2008 Arizona Senator John McCain called for a renegotiation of the plan. In 1935, when Arizona Governor Benjamin Baker Moeur sent 6 members of the Arizona National Guard to observe the dam's construction, they reported back that there was construction activity on the Arizona side of the river. Arizona Attorney General Arthur La Prade concluded that the Metropolitan Water District had no right to build on Arizona's territory, which prompted Governor Moeur to send a larger National Guard force to halt construction. The troops were recalled when Secretary of the Interior Harold L. Ickes halted construction until the issue had been settled. The Department of the Interior took Arizona to court over the issue hoping to end the state's interference. To the Department of the Interior's shock, the Supreme Court sided with Arizona and dismissed the injunction. The court concluded that the dam had never been directly approved by Congress and that California was not entitled to build on Arizona's land without Arizona's consent. Arizona eventually agreed to allow the dam in exchange for approval of the Gila River irrigation project. Parker Dam as viewed from Arizona. Parker Dam as viewed from California. ^ Bureau of Reclamation (2009). "Parker Dam". U.S. Departmentof the Interior. Archived from the original on 2011-01-29. Retrieved 2009-09-29. ^ a b Bureau of Reclamation (2009). "Parker Power Plant". U.S. Departmentof the Interior. Retrieved 2009-09-29. ^ "Central Arizona Project History". cap-az.com. Archived from the original on March 20, 2016. Retrieved August 12, 2016. ^ The Pueblo Chieftain article: McCain: Renegotiate 1922 Western water compact. Retrieved October 10, 2010. ^ Tempe Historical Society biography of Benjamin Baker Moeur Archived 2008-04-10 at the Wayback Machine. Retrieved October 10, 2010. ^ Open Jurist summary of 295 US 174 United States v. State of Arizona. Retrieved October 10, 2010. Wikimedia Commons has media related to Parker Dam. Historic American Engineering Record (HAER) No. AZ-54, "Parker Dam, Spanning Colorado River between AZ & CA, Parker, La Paz County, AZ"
This page was last edited on 27 August 2018, at 00:41 (UTC).